If all you want is the lobster tail, does it make a difference whether it is from a cold water lobster (a Maine lobster) or a warm water lobster (a spiny lobster or rock lobster)? Cold water Maine lobster tails is usually whiter, sweeter, and cleaner tasting, and the meat is usually firm but tender. Cold water lobster tail is also usually more dependable; warm water lobster tail is more likely to become mushy during cooking, to have less flavor, or to have a yellow or even grayish color. For New Year’s Eve, I bought two 1-lb frozen cold water lobster tails. 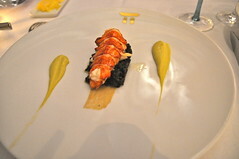 I’ve been cooking lobster for 20 yr’s and have never seen anything like I saw with these tails. The shells practically fell off, under the shell, attached to the meat was a bright red, rubbery thick membrane (for lack of a better word). It was difficult to separate the meat from this rubbery stuff and the meat had no taste. Anyone have any ideas????? Steamed 1-1/2lb Maine lobster how many calories? We’re not sure whether you’re referring to the lobster itself or the meat inside, but there are about 111 calories in 4 oz of lobster meat. So, if you have a pound of meat has about 444 calories. We hope this helps!